Goodreads appetizer: The Scarlet Letter meets Minority Report in bestselling author Sophie Jordan's chilling new novel about a teenage girl who is ostracized when her genetic test proves she's destined to become a murderer. First of all I have to note that the second part of the book was way better than the first one. Should the story start at the point the second part began maybe I would feel a bit differently towards Uninvited, not that I didn't have a number of problems with the second part too, it's just that it was far more interesting and Davy a little less annoying. Anyway, Uninvited didn't work for me almost from the beginning. Even if the main idea of the book was somewhat fresh and intriguing, the whole plot was too predictable and a little disturbing at times. I'll come back to the disturbing part in a bit. Davy and Sean gave off a Bella and Edward feeling the whole time. I can't pinpoint exact resemblances between these two couples but while reading Uninvited and the way the romance between Davy and Sean bloomed I kept thinking the whole time about Twilight. Maybe it was the way Sean was overprotective towards Davy. How he kept protecting her one minute and the next pushed her away because he was dangerous. The fact remains that Davy and Sean and their insta love was something I have read millions of times before. And sadly there was no distinctive quality in their romance to make them stand apart. The idea of Uninvited is quite fresh like I said. The idea of a kill gene intrigued me but the execution of it, left me thoroughly disturbed. 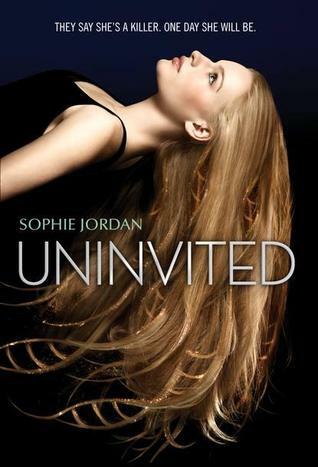 I mean Uninvited is set in the future, a future so advanced that we are able to detect people with killing tendencies, but Sophie Jordan's world could as well have been one set 50 years ago... Because I can explain no other way the complete disregard of the environmental factor in someone acting on any homicidal tendencies he might have in his DNA... In Sophie Jordan's world, scientists think that all it takes for someone to kill or be violent is to have that kill gene. Everything else is of no importance. I mean how can I believe that in the future any behavior is a sole result of genes and little else, while right now we positively know that for an individual to acquire some behaviors major role plays the environment, how someone learns to behave by imitating the behavior of people close to them and many other factors that have to do with the way someone lives and what he learns is right or wrong? While reading Uninvited I couldn't help but think of the way people regarded mental disorders some years ago. And no, believing that we can step back instead of moving forward is something I refuse to believe and find realistic. And that's the first thing I found disturbing about Uninvited. And that wasn't the only thing I couldn't buy... The whole plot was full of unrealistic moments and holes. Some things were rushed and a prime example of that is the transition from the first part of the story to the second one. In the moment when the government is most afraid of the carriers of the kill gene, Davy is miraculously chosen for a different fate, among a few more select ones. And while the government painstakingly chose those few carriers, just because Davy suggests it, they bring in the team Sean as well... He's not special, but since Davy who is special recommends him that earns him a ticket. How more unrealistic could a situation be? Verdict: Uninvited didn't work for me in any department I'm afraid... Even though I really enjoyed Sophie Jordan's writing style and despite some good moments, in overall I couldn't enjoy this book. It's not that it's a bad book, it's just not my cup of tea. The plot turned out to be one I couldn't really enjoy and if you combine that with the fact that I couldn't connect to any of the main characters you can easily understand why I quickly lost my interest in this story.